Pick up from Madurai Airport by Noon. In the evening, Visit Madurai Meenakshi Amman temple in the evening. 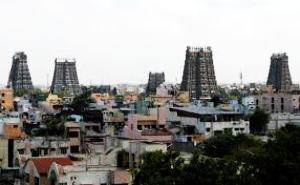 Meenakshi Amman Temple is dedicated to Parvati, known as Meenakshi. 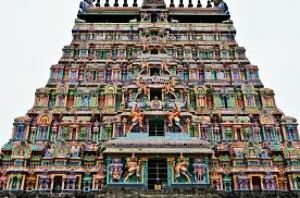 There are 14 gopuram the tallest of which, the famous southern tower, rises to over 170 ft 52 m and was built in 1559 and two golden sculptured vimanas, the shrines over the garbhagrihas sanctums of the main deities. Have an Overnight stay at the Hotel in Madurai. In the morning, after breakfast, visit Alagar temple which is one of the 108 Divyadesam dedicated to Vishnu. A iety of statues in different postures of the Lord are all kept in the temple under the same roof and is the best form of distinct temples in southern India. Then, visit Pazhamudircholai Murugan Temple which is one of the adobes of Aaru Padi veedu of Lord Murugan. This temple was built in the memory of Lord Subramaniya who is worshipped by several people in southern India. It has great sculptures of Lord Subramaniya carved in wood and marble and is a wonderful temple with giant steps in the front of it. It will take almost 4 hrs to visit these temples. Then start to Rameshwaram after Lunch. Madurai to Rameshwaram - 3hrs 30 min . In the evening, visit Five faced Anjaneya temple, floating stone in Rameshwaram. The temple is situated just 2 km from the main city temple and has a statue of Hanuman with sindooram. In 1964, the idols of Lord Rama and Goddess Sita were brought from Dhanushkodi and placed in this temple. 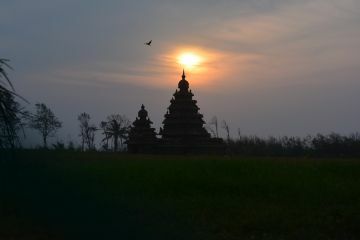 It is believed that the floating stone used for constructing the stone bridge across the sea, lies outside this temple. This floating stone was used for building Sethu Bandanam, the bridge connecting India and Sri Lanka. If you have time, visit Gandhamadhana Parvatam is famous for its beautiful sunrise and sunset. 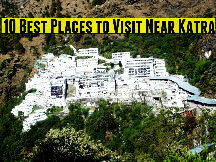 It is a holy place for the pilgrims, who come to worship Lord Rama's footprints. The double storied Mandapam of the Ramjharoka Temple on this hillock houses the footprints of Lord Rama on the Chakra. Have an overnight stay at the Hotel in Rameshwaram. In the morning, visit Ramanathaswamy Temple which is a Hindu temple dedicated to Lord Shiva located on Rameswaram island. 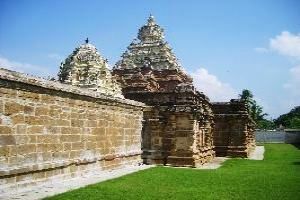 It is also one of the twelve Jyotirlinga temples. It is one of the 276 Paadal Petra Sthalams. Then visit Agni Tirtham which is one of the Tirthas of Rameswaram. Then visit Sita Kund, Lakshman Kund and Villondi Theertham. Visit Dhanushkodi and Adam's bridge. Adam's Bridge starts as a chain of shoals from the Dhanushkodi tip of India's Pamban Island and ends at Sri Lanka's Mannar Island. Have an overnight stay at the Hotel in Rameshwaram . After Breakfast, start to Trichy. 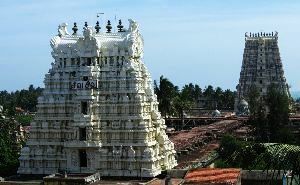 Rameshwaram to Trichy - 4 hrs 5 min Visit the Trichy Srirangam Temple. Then Travel to Thanjavur. Trichy to Thanjavur - 1hr 6 min In the evening, Visit the famous Brahadeeshwara Temple Big Temple in Thanjavur. Have an overnight stay at Thanjavur Hotel. After Breakfast, start to Chidambaram. 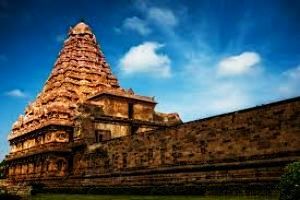 Thanjavur to Chidambaram - 2 hr 45 min - 117 km Visit the famous Thillai Nataraja Temple and Thillai Kali Temple. 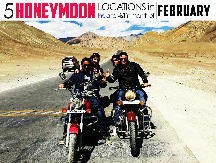 Then Travel to Pondicherry. Chidambaram to Pondicherry - 1hr 34 min - 62. 7 km. Have an overnight stay at Pondicherry. After Breakfast, visit Aurobindo Ashram and Sri Manakula Vinayagar temple. then Visit Auroville, Sea side Promenade, French War Memorial and Rock Beach in Pondicherry. Overnight stay at Pondicherry. After Breakfast, Start to Mahabalipuram. Pondicherry to Mahabalipuram. 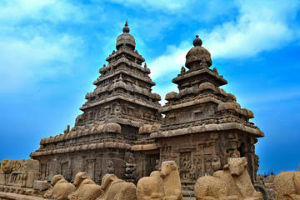 Then go for sightseeing at Mahabalipuram seven monolithic temples, each carved from a single granite boulder standing on the sea shore. In the village, you will see Arjuna's Penance, which is cut on to a flat granite rock face. Visit Tiger's cave, Mahishashuramardhini Rock cut mandapa. In the evening start to Kanchipuram Mahabalipuram to Kanchipuram 1 hr 30 min -50 km Checkin at the hotel and have an overnight stay at Kanchipuram. In the morning, travel to Tirupathi. Kanchipuram to Tirupathi - 2 hr 40 min Check in at the Hotel in Tirupathi. Then travel to Tirumala and complete the Special Entry Darshan. Then in the evening, visit Padmavathi Thayar Temple and few other temples in Tirupathi. Have an overnight stay at Tirupathi. In the morning, after Breakfast, travel to Vellore. Tirupathi to Vellore -2 h 36 min 112 km. 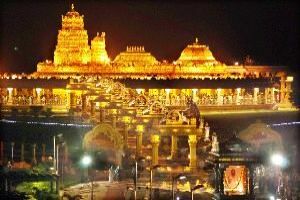 Visit the famous Sripuram Golden temple in Vellore. 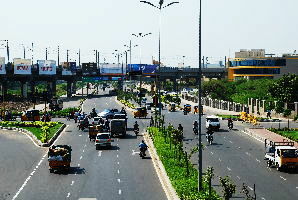 Then start to Chennai. Checkin at the hotel in Chennai. In the evening visit the Marina Beach. This is a famous Beach which is the worlds second longest natural urban beach. The sandy shore stretches for 13 km 8. 1 miles. Enjoy the breeze of the beach and have an overnight stay at the hotel in Chennai. 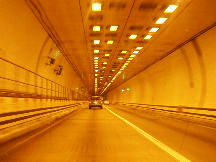 In the Morning, travel to Airport. Drop at Chennai Airport.